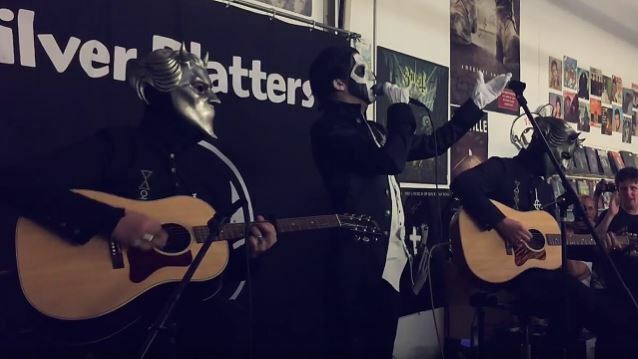 "Iron" Mike Savoia of Savoia Concert & Event Photography has uploaded video footage of the first show of the "Unholy/Unplugged" tour by Swedish occult rockers GHOST, which took place on Tuesday, August 18 at Silver Platters in Seattle, Washington. Check it out below. Aug. 20 - Amoeba Records - Los Angeles, CA - 6 p.m.
Aug. 21 - ZIA (Camelback Location) - Phoenix, AZ - 7 p.m.
Aug. 22 - Sound Garden - Baltimore, MD - 2 p.m.
Aug. 23 - Rough Trade - Brooklyn, NY - 2 p.m.
GHOST's June 3 warm-up show at at Doom in Linköping served as the group's live debut with their "new" singer, Papa Emeritus III, the three-month-younger brother of GHOST's previous frontman, Papa Emeritus II.